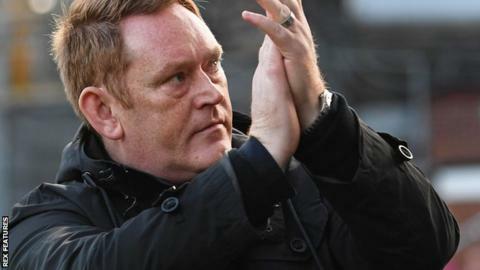 David Hopkin has resigned as manager of League One strugglers Bradford City after less than six months in charge. The 48-year-old Scot replaced Michael Collins in September, but only won seven of his 35 matches. Hopkin's final game saw the Bantams lose 3-2 at 10-man Walsall on Saturday to leave them 23rd in the table. "I have given my all over the past six months. I took on a tough job and have left no stone unturned in my efforts to help us climb the table," Hopkin said. "The club means a great deal to me as a former player and that is why I have made this decision - with a quarter of the season remaining." Bradford are now looking for their fourth permanent manager since Stuart McCall was sacked in February 2018. Simon Grayson departed in May and Irishman Collins left after just six league games on 3 September. The Bantams are three points from safety with 12 league fixtures remaining. First-team coach Martin Drury will take charge for Saturday's match against Portsmouth, alongside Anton McElhone. The defeat by the 10 men of Walsall was seemingly the final straw for Hopkin. Afterwards, it felt like psychologically Bradford had been dealt a huge hammer blow to their hopes of survival. Three points from safety with Portsmouth, Peterborough and Luton to come, the gap could end up being a lot bigger. The fact Bradford even have a chance of survival - mathematically anyway - means Hopkin deserves plenty of credit. A poor pre-season combined with injuries and a bad start to the season took its toll. With 12 games to go, it's not impossible for Bradford to stay up; there are some decent players in that squad, but for many, Walsall was the final nail in the coffin. Whoever is next has to get the players to believe they can keep Bradford in League One, and the players need to make believers out of us all again. For many, that belief has gone.